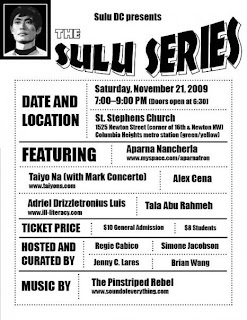 The Sulu Series is this Saturday at the words, beats, and life church. There are 4-5 people performing at it. Me and Alex are one of the 5 performance. We've been working extra hard on this slam poetry and we have only 2 days until the performance and we barely remembered all our lines. But we have confidence that this will be a great one. We wrote about how people criticize Asians and how they always get bullied in school and on the streets. So we thought we should say something about it. It will be interesting so if you want to support me and Alex and give us more confidence in our work. It would be an honor to see you at our performance this Saturday. Why I keep coming to aalead.